Help for brides is here for those needing advice on wedding attire etiquette." Check this page often for new FAQ from brides needing answers about their wedding dresses and about special circumstances. Check out other sections of this website for more details on some topics. FAQ: Can I choose to wear wedding dress in any color for my wedding? Colored wedding dresses are the trend now for bridal gowns. You can even add color to a white or ivory wedding dress by adding a sash or cummerbund. So yes... you can wear whatever color you want for your wedding dress. Black wedding gowns are acceptable now . . . although for most brides this would not be the color they would choose. One tip though--- make sure that the color you choose compliments your skin tone and doesn't wash you out. Pay attention to this even if it is a shade of white that you are considering for the color of your wedding gown. For example colors like... candlelight, off-white, cream or ivory will look better than a stark white on some complexions. FAQ: How do I handle family members who feel its not proper to break from the old" wedding attire etiquette rules? Among some families that have strong traditions this can be a big thing. They are concerned about the family name and not wanting to have anyone talking negatively about it. You want to plan ahead of time how you will address this situation. Especially when you know that breaking from tradition could cause some problems. Know yourself and how strongly you feel about having things your way. One thing that may help is to show family the research you've done looking into wedding attire etiquette. Show them that any color and style of gown can be appropriate bridal dresses for a second wedding. This usually will help to allay any fears older family members might have. You also might be able to compromise to keep peace. But if compromising isn't in your best interest, then guess what? When it comes to style and color... that's a personal thing. Since anything you wear reflects your sense of style and your personality in your wedding, you have to be the one to make the final decision. After all... it's YOUR wedding. 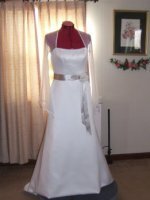 FAQ: I am having a religious wedding ceremony, are there wedding dress styles I shouldn't wear? It depends on what religion you are affiliated with and on what individual ministers require. This is something you need to discuss with whoever is officiating the wedding ceremony before you purchase your gown, if possible. Why do I say this? I have had brides come in and have me add to their wedding gowns to fill in the neckline cleavage area of the dress for a more modest look. This wasn't because they wanted it done. It was because of something the minister said. The brides found out during a counseling session, the dress code requirements the minister had regarding the wedding dress. "They usually find out after buying their bridal gown that the minister had a dress code." If you feel this could be a problem . . . ask the minister right away what they expect. "I once had a bride who had attended another wedding... tell me a story about a minister who asked a bride to wear a dinner napkin to cover her cleavage during the reception. Can you imagine that? Don't' let this happen to you! Find out what you need to before you buy your gown!" FAQ: My religion requires---for proper wedding attire etiquette---a modest wedding dress. Can you give me some suggestions on where to find one? Go to the the sections of this website for simple wedding dresses and also modest wedding dresses for tips and advice.